Do you or those around you struggle with the desire for traditional meat and potato meals on one hand, and for healthier salads and green meals on the other? When we eat the HumanaNatura way and follow HumanaNatura’s OurPlate healthy eating guidelines, we don’t have to choose between these two seemingly competing desires. While our best science does suggest limiting red meats – see red meats and carnitine – this does not mean eliminating them completely, especially when they are extra-healthy and ecologically sustainable grass-fed meats – and as long as they are not processed meats, which indeed should be removed entirely from our diets. Today’s sample HumanaNatura Salad Meal combines meat and potatoes with a selection of vegetables and fruit to create a hearty, satisfying, and healthy meal. We begin by steaming a few cubes of ground grass-fed beef on top of a base of diced sweet potato and onion or shallot, along with crushed and finely chopped garlic and a dash of cayenne pepper for about five minutes (see our Cooking With Steam Overview for guidance if you are new to food steaming). When done, the beef and root vegetables are allowed to cool for a few minutes. As the cooked beef and vegetables cool, a salad base of mixed greens is combined with a simple veggie mix of halved grape tomatoes and cut and de-seeded orange pieces. The cooked foods are then added, and the entire salad is dressed and garnished with parsley, black pepper, and shelled pistachio nuts. Lastly, the beef and potatoes are further seasoned with a zig-zag of chili sauce, and the meal is served promptly. A delicious blend of traditional cuisine and healthy modern natural eating! Optimal natural eating first involves care, and then balance. After we remove harmful sugar-rich foods, nutritionally and ecologically less desirable grains and legumes, and other unnatural or unadulterated foods from our diets, we must still achieve a balanced mix of natural foods – with neither too many nor too few natural fats, proteins, and carbohydrates, and ensuring adequate natural fiber, vitamins, and minerals. Fortunately, when we eat the HumanaNatura way and follow HumanaNatura’s OurPlate healthy eating guidelines, creating naturally balanced and nutritionally optimal Salad Meals and Steam Meals quickly becomes second nature. The simple, rustic HumanaNatura Salad Meal we have featured today begins by steaming a serving of wild salmon and some chopped broccoli on top of a base of diced sweet potato and onion or shallot, along with crushed and finely chopped garlic, for about five minutes (see our Cooking With Steam Overview for guidance if you are new to food steaming). When done, the salmon and root vegetables are allowed to cool for a few minutes. 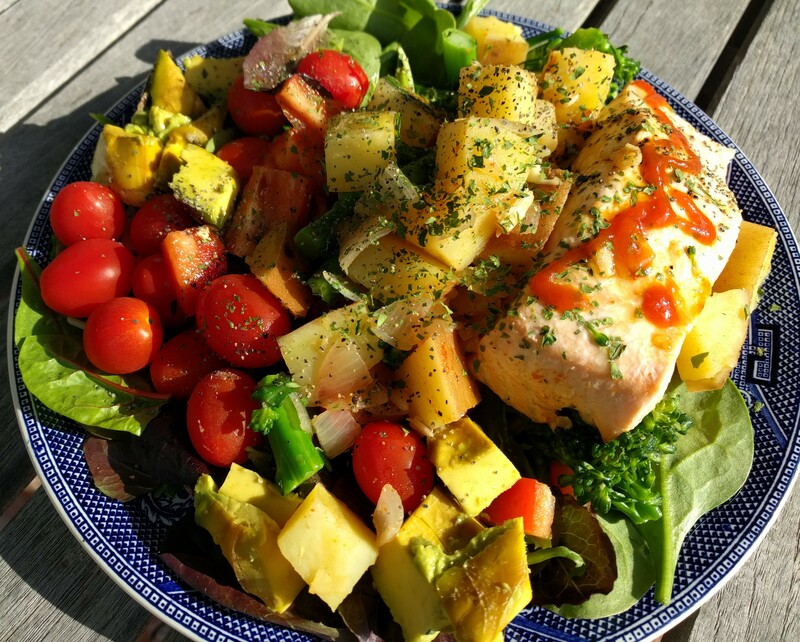 As the cooked salmon and vegetables cool, a salad base of mixed greens is combined with a simple veggie mix of grape tomatoes, chopped red pepper, and diced avocado. The cooked foods are then added, the entire salad is dressed and seasoned with parsley and black pepper, and the meal is served promptly. Fast, delicious, satisfying, and naturally balanced!